I'm stuck and I'm not sure which way to go or if not moving at all is the right answer. I'm not sad or depressed or anxious. Well, maybe a little bit anxious. But I've got these things that I wish were different, things that pretty much only I can make different, but I can't seem to make any movement toward any of them. I'm just stuck. I think it goes back to my existence as a messy perfectionist. Or it might have to do with the fact that I'm a great idea person, but am not so swift at the details. I would call this state of standstill a midlife crisis but a.) it doesn't feel like an actual crisis (thank God!) and 2.) midlife crisis sounds so cliche. 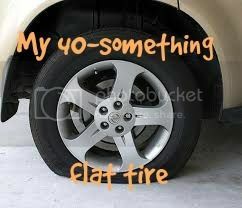 It's more like a 40-something flat tire. Annoying. Inconvenient. Fixable. There are two things I can think to do in my current stuck-ed-ness. First, pray. It's always the right answer and should always be my first answer, but it isn't. But I'm thankful that when I think about where I am and where I want to be and how I have no idea how to connect the two, the thought of prayer rises to my consciousness. Second, write. Writing here, yes. But also, I know that if I sit down to just right about where I am stuck, why I feel stuck and what I could do differently, writing it all out just for myself, that some clarity will rise to the surface. Pray. Write. Move. Maybe once I spend some solid time doing the first two things, the third will come along as a natural consequence. What do you do when you're stuck?